Vising the the dramatic landscape of Iceland near Kalafell. 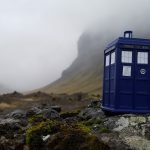 See more of A TARDIS Abroad. 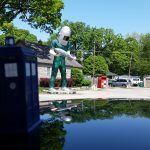 On Route 66 with the TARDIS in Wilmington, IL at the Launchpad Diner. See more of A TARDIS Abroad. See more of A TARDIS Abroad. 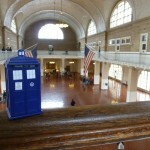 The TARDIS visits Ellis Island in New Jersey, NY. See more of A TARDIS Abroad. 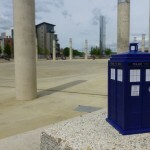 The TARDIS visiting Tourchwood in Cardiff for a quick refueling. See more of A TARDIS Abroad. On the streets of Chicago, IL at the intersection of North California and Shakespeare Ave. 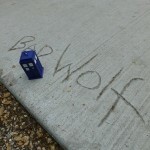 Along with the fateful words, “Bad Wolf.” See more of A TARDIS Abroad. I cannon imagine how long this took to set up. But we are glad someone had the patience to do it. 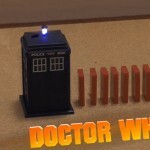 Enjoy this impressive domino display dedicated to Doctor Who and specifically the adventures of the 10th Doctor, but be carefully don’t blink. 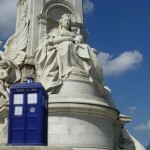 The TARDIS hanging out with the Queen at her Memorial in London just outside Buckingham Palace. 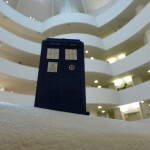 See more of a TARDIS abroad! 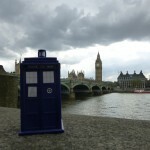 The TARDIS taking in the sites on the back of the Thames looking back at Big Ben in the heart of London. 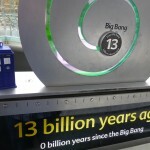 See more TARDIS abroad!